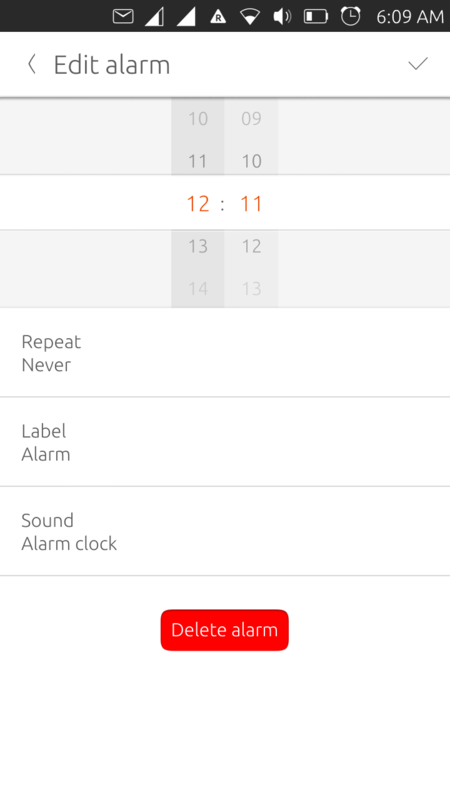 Alarm should be moved at the bottom of the alarm list. Alarm is moved at the bottom of the alarm list. Unfortunately the hour of current and previous alarm is not correctly set. Close alarm list and open it again by swiping bottom edge. Here's my alarm list, all are deactivated now. I'm going to activate the second one only (10:22 AM). After activating the second alarm, we find something's not right. The active one should have gone to the bottom of the list and 12:11 PM one should have been place fourth. But the time and toggle switch display is erroneous. Now I try to edit the 4th entry (displaying as 10:22 AM with toggle switch on), but the edit menu opens for the 12:11 PM one. 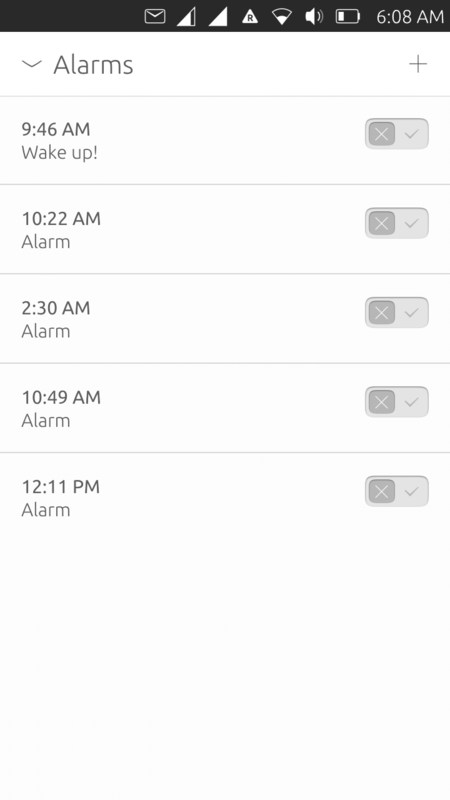 Thus the problem is with the display of alarm time only, alarms are getting repositioned as expected after activating one of them. Normality is restored after closing and reopening the alarm list by swiping the bottom edge. This bug is not in Clock but rather in Ubuntu.Components. First I would try to reproduce it with some minimum project. This also happens to me every day. It's not needed to keep the alarm list open, it's only needed to wait until the alarm rings. 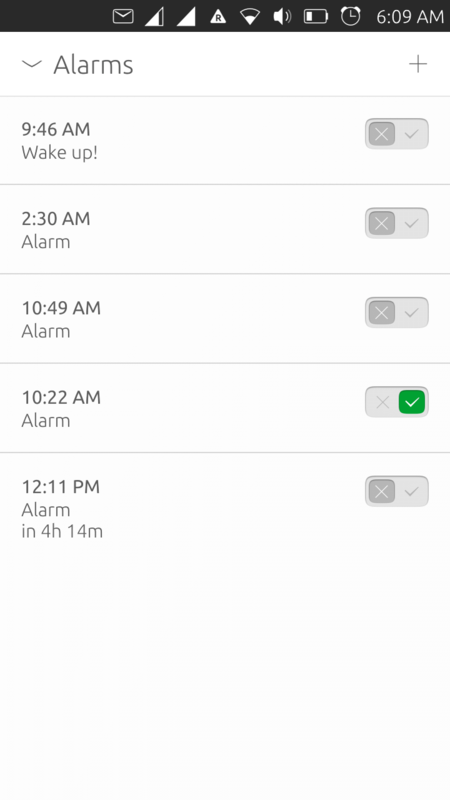 When re-enabling the alarm in the middle, the remaining time is displayed at the bottom, but set time is not reordered. If I then tap again on the middle one, the UI gets even more messed up displaying the same time twice, but with different remaining times. 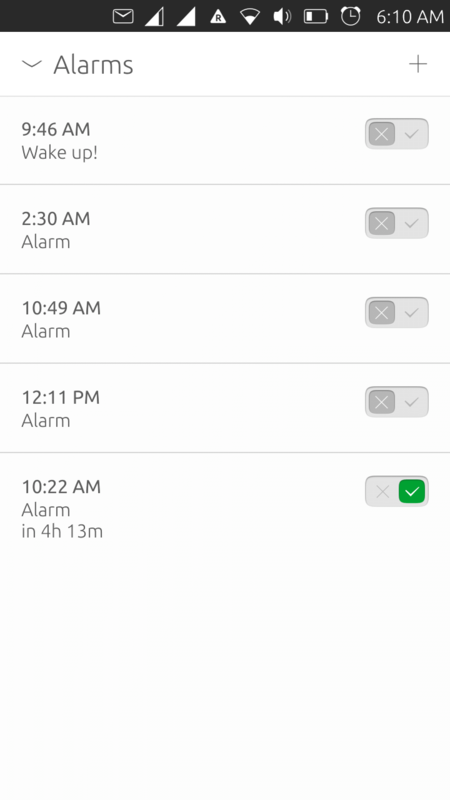 The displayed alarms and remaining times get corrected, if I close and reopen the alarm list, or if I swipe a little bit from the right like if I want to switch tasks, and select the same again or swipe back without actually changing to another task.